>I have Sabrina in this afternoon (and thinking of Casey, actually, and wondering how she’s getting along with her dress! 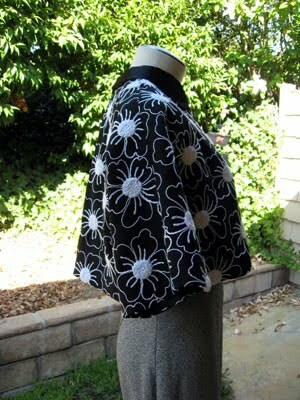 ), and I’m taking a sewing break- finishing up a jacket that I started two days ago. I found this wonderful embroidered wool at an estate sale- it’s a vintage length and still have the original cut tag stapled to it. When I was going through things for my fabric de-stash I considered letting it go, then talked myself into keeping it. Now, of course, I’m eying the pile in the sewing room wondering if I should take some lengths down and make something from them! Never mind the bins and bins of fabric in the garage… I think if you can’t see it, you can’t be inspired by it! I had JUST enough to squeeze this out, minus collar and cuffs. I showed it over a 30s dress I made last year, but since the 50s was influenced a lot by the 30s I figure it would work! It’s the color of the dress peeking out the top. 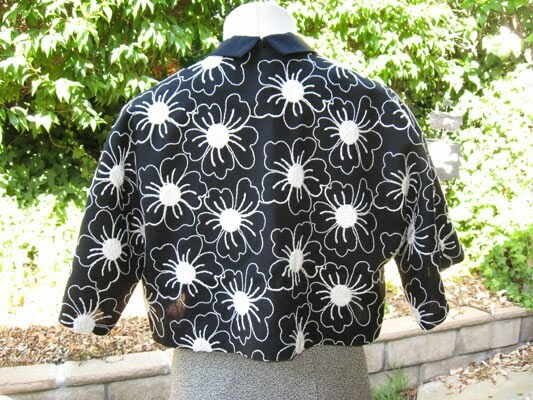 I’m thinking if I can find a vintage white fur collar that it would suit this little jacket well! I’ll just slip stitch it on if I ever run across one. 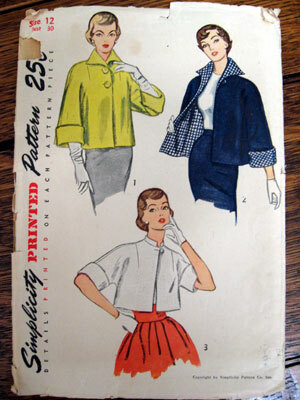 I love the way these 50s cropped jackets flare out a the back- it’s almost a cape-like effect. I think the first time I fell in love with them was seeing Three Coins in the Fountain, and actually after a quick google search I found this blog post at Sweet Sunday Mornings, with an image of the slate blue suit I’m talking about! Someday I’ll make one as refined as the one Maggie McNamara wears. Many thanks on the nice comments on my big fluffy petticoat! The pattern I ordered from Etsy got here yesterday and I’m itching to get the dress started. This weekend, however, we’ve got a brief bit of time travel to the 1870s, so it may have to wait. I admit I’m feeling totally uninspired to cover a parasol I’ve got waiting. Maybe I’ll just bring it as-is, in it’s lovely plasicy glory. Isn’t it funny how you want to always be working on something that’s not what you’re supposed to be doing? 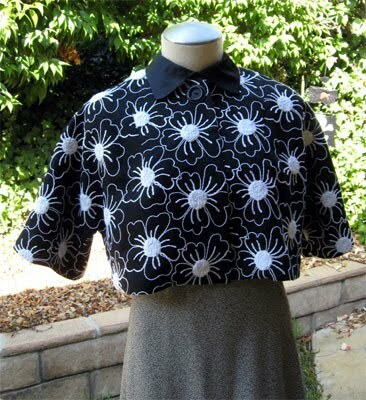 I did update the etsy store this week with quite a few goodies- some vintage clothing and some Halloween inspired things. I admit I had a bit of fun with some of the pictures, and I look very silly in quite a few that my husband took of me, but oh well. It was fun playing model for an evening down at the park. That’s about all the news here. Happy friday and hope everyone has a glorious weekend! >That jacket is so darling! I love it!